Includes Anakin Skywalker�, Ahsoka� and R2-D2� minifigures, plus Rotta� the Huttlet! The Twilight has moveable wings and retractable landing gear! Open the back to use the working tow-cable winch! Detach the side-mounted escape pod! Rotate the laser cannon turrets on top! Measures 12" (30cm) long and 18" (46cm) wide! I would buy it just simply because I collect all Minifigure Scale Lego Star Wars Sets. The new minifigures is one of the only thing that makes worth buying this set other then having a complete collection. Rotta is actually one of the great redeeming qualities of this set. They made him with pose able arms which is better then some of the stuff Lego has been doing. (I.E. those trans green aliens) Then there�s Ahsoka! She's a smoking hot alien and this little minifigure is almost perfect as far as Lego makes. They made her hair piece out of plastic which I�m sure many of us will be very happy about. I didn't have any problems getting this set, several on shelves but Lego says it's "hard to find" so grab it if you see it. Cons: Poor variation of parts/pieces makes me want to scrap it. But then my show room collection wouldn't be complete. It had a lot of angled plates but only the left or right one not a pair. 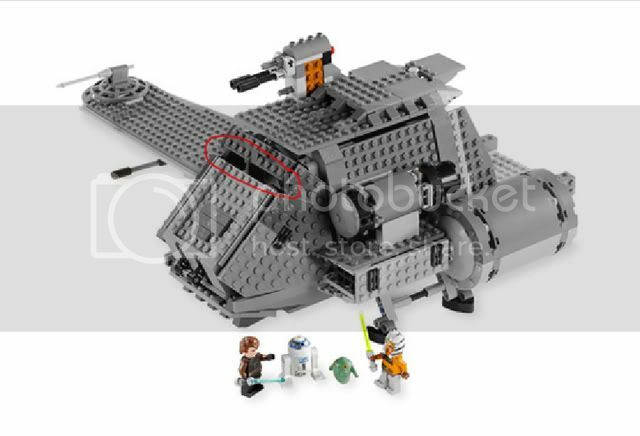 Ok details for this ship are almost completely missing! There�s no windshield for starters, no floor in the main cabin, large hole into main cabin where the dorsal gun is, large rear deck with no details, large holes in the cockpit, and he read hatch is blocked by a winch which is good cause if walked in you would surely fall to death since there�s no floor. So overall Lego sucked big time on this one. Can they hire someone who can at least build a ship with a windshield? Idiots. Also the set is pretty breakable. It has 2 pods (1 escape, 1 engine, both can detach too easily) It's pretty breakable as I said before. Also lacks bells and whistles sooooo... ...no. Worst Lego Star Wars Set since the bucket set. Well, keep in mind that the bucket set was specifically aimed at five-year-old kids, while this monstrosity...it's just trash for all ages. Good review, Rook. I wasn't interested in this set until reading about it in the visual guide (which is absolutely awesome!). I don't want to spoil anything, but I'm getting Falcon type vibes off it. Location: An X-Wing crashed in the Eiffel Tower - not the Vegas one !! Well I loved the firts images of the set we saw and it wasthe fuirst set I bought at Midnight Madness and I really love it !! I really don't agree with you on different points. Regarding the design I tink that ships rock big time !! I love the old blocky aspect of space shuttle. It has this very particuliar aggressive and boxy look. And as a cargo ship its great to have a huge platform at the rear. The wing design is really wwell done and I love how the small moveing wing attaches. Also the top gun can move which is a great feature. "Away put your weapon, I mean you no harm"
Availability: 10/10 I didn't have problems getting it, several on shelves but Lego says it's "hard to find" so grab it if you see it. Hard To Fine by Lego means it isn't available at every retail store..but the stores that do carry it will have tons. It's a TRU exclusive, right? It's a TRU exclusive, right? Can they hire someone who can at least build a ship with a windshield. Idiots. [quote="Rook"]Can they hire someone who can at least build a ship with a windshield. Idiots. ...is such a missss! Every collector could have told them. And if they asked me (though they won't) for the general SW line, I'd tell they should concentrate on small and cheap sets with juniorized vehicles and ships or playsets rather than great-but-expensive with lot of pieces and few figs BECAUSE cheap sets with cool figs are for children while expensive sets are adult collectors' business. 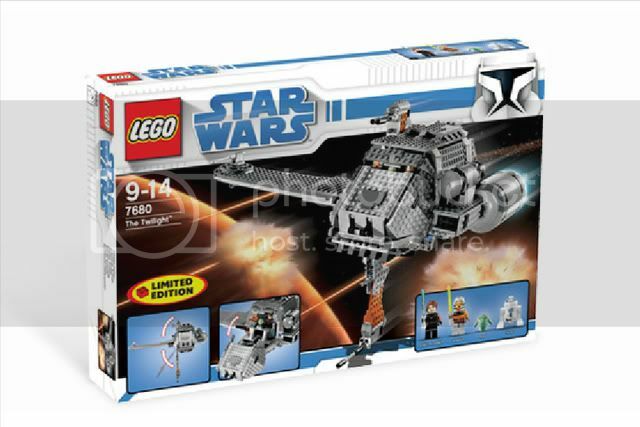 Anyway, big UCS sets remain great, very great, but only for those who can afford them, i.e. AFOLs. 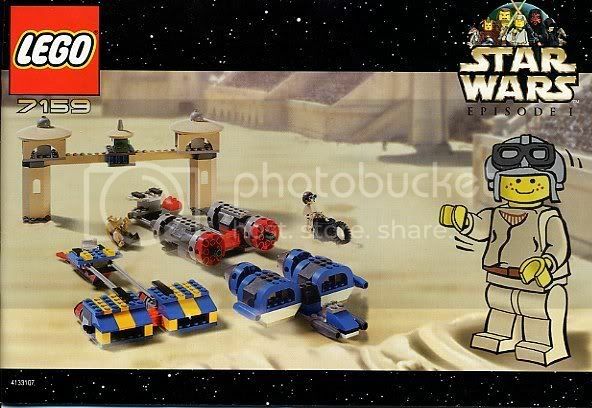 So I'm the only one who really liked the Podracer Bucket? If I could get it cheap and actually had any money to afford it in the first place, this looks to be a nice target for modification into a transport, or at least a nice parts stash for the big house of plates designs I seem to be working on of late. As far as the gaps and lack of realistic interior space, TLC has been doing that for years, so I hardly expect anything different. It is pretty easy to add a floor to the interior. This makes a big difference to its 'playability' so that it can hold lots of cargo, figures or a speeder. The lack of some kind of windscreen is a bad omission. The price is the biggest obstacle. I wouldn't be suprised to see the set heavily discounted in the new year to finally persuade the naysayers to pick it up.. Overall it is quite a solid well constructed set. If only Lego had included one extra and really desirable exclusive mini-figure I feel it might have become quite a hot item. Worst Lego Star Wars Set since the bucket set. At least the bucket set was cheap! So that makes it a good set? No, but it was less of a waste of money. I actually think that the Twilight is not bad. Not terrific, but not bad. I hope to get it for Christmas. At first I thought this set looked terrible, but it's grown on me. I'm still not going to get it, but I think it looks half decent. But Ive always been a fan of those large, junky looking ships like the Falcon. Well, it looks pretty cool, but think of what else you can get for that price! My new Death Star II is a better deal. I think this ship is a lot better than most people give it credit for. The windshield thing really isn't a problem, seeing as how it captures the shape perfectly. 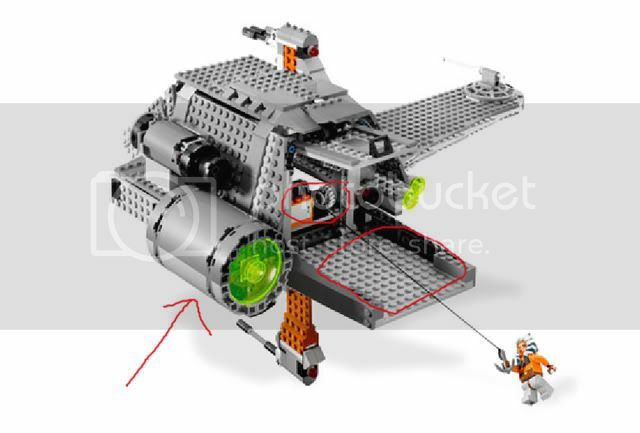 You can't deny that the mechanical aspects of the ship are well designed, like the landing gear, or the red pins that fit everything together. As far as the ship's stability, I think it is quite the opposite, it seems really sturdy. you just don't pick it up by the pods that are only connected by a couple pins, you pick it up by the middle. Seeing as how the escape pod is supposed to detach, I don't see why that is a drawback. One of my personal favorite parts of the ship, is that the colors are really well situated. Sometimes there are inexplicable patches of colors on ships that don't match, but in this one, there is a solid chunk of dark grey, solid patches of earth orange, and other stripes. I think they did this well, as it really captures the solid colors that the animated style would use. The real issue with it is the expense of the set. It should be around 80 or 90 bucks for it to match the 10 cent price to part ratio. So it is definitely not the right price, but if you can snag it at a discount, I think this set has a lot more to offer than most people think. For a kid, I think this set has a lot more appeal, obviously. And However you spin it, Lego is a child's toy. 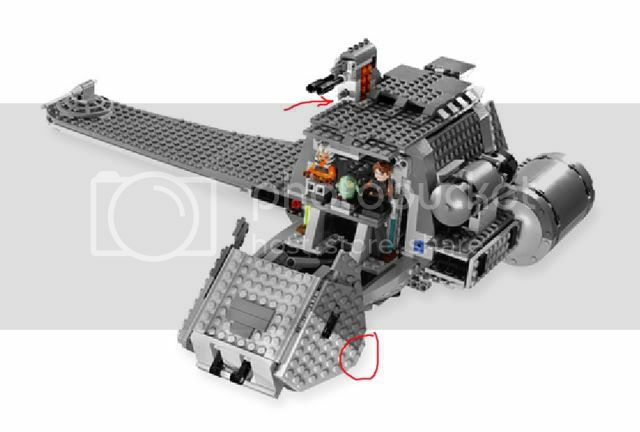 There are lots of play features here (like the missile launcher, the clever door mechanism, the S-foils, the opening cockpit, the escape pod, the winch, and the fact that it is pretty swooshable for a clunker). If it isn't spot on, then just deal with it. Especially since, well you know, it's Lego, and you can fix it however you want. And do you really think the AT-ST and the Ultimate Lightsaber Duel were both better than this set? Of course, you can think however you want. Everyone has their own opinion. Attention, any guitar, music, or wikia savvy folks, the guitar wikia needs your help! A really long post about how the Twilight isn't so bad that TK didn't feel like quoting. Yeah, you have several good points. I got this set for Christmas, and it is actually one of my favorites now. If you grab it in the center, you can swoosh it pretty well. Also, as Yesh said, the windshield isn't much of a problem. One more thing about the Twilight. It, as WookieWarrior9 said in July, definately reminds me of the Falcon. I like the "old freighter that was upgraded" bit. I found that it was a bit overpriced and that the lack of a floor hampered it's playability, but then again, I feel that a lot of the sets ned a little tweak to make them more playable. I acutally liked the fact that with an easy modification to the engine pod, this thing opened from 4 sides, which left lots of room to add features and interior gubbins. OK, so any set you have to modify isnt a great set. But I'd give it a 6. I agree that this ship does not deserve all the negative comments. I just finished mine, and it was a fun build. Customizing it shouldn't be too bad. I have already added cockpit glass to mine, and filled in a couple of gaps. I do plan to enlarge it, add the lower boarding ramp and increase the hull size to hold Anakin's starfighter as seen in the series. It reminds me of the Falcon I guess....not by looks obviously, but by characteristics. Yeah it's clunky looking....that was by design.